For people who are familiar with traditional Chinese paintings, it is obvious that there is an unspoken rule related to ‘humble’ and ‘simplicity’. It seems that most of these famous ancient paintings are trying to hold back the artist’s passion about life. A big contrast could be, if you look at some art works of Goya, you feel the pain deep from heart. If you look at Chinese paintings created around similar period in China, you feel like this painting is so far away from such strong emotions. A famous, also one of Inkston’s most favourite Chinese artist, Ba Da Shan Ren (八大山人) had very simple, clean, elegant, and ’empty’ painting style. Therefore, it is common for people to get the impression that Chinese style paintings are peaceful, austere, and plain. In fact, very fancy materials such as gold and silver have been used quite a lot in Chinese painting/ calligraphy. 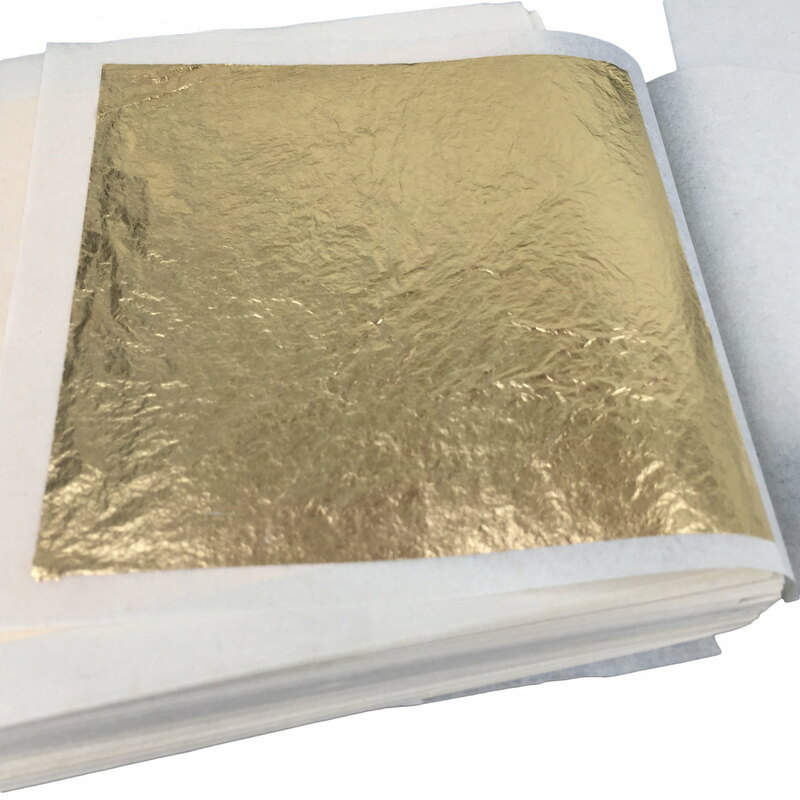 Besides the fine handmade gold flecked xuan paper, silver shimmer mica sized Xuan paper, you can also find gold ink, silver ink, and gold foil in current inkston art material supplies. In this article we will talk about several interesting and easy-to-apply techniques to help you make the most of these fancy materials to enhance your painting. Please always remember to apply the foil when there is no wind. High quality gold foil is very expensive and light. Even very light wind would damage it completely. Please be careful. A very useful tool would be a bamboo spatula. You can use the bamboo spatula to lift gold foil from its protection layers, cut the foil into special shapes, attach gold foil to wherever you need, etc. What type of glue to use with gold foil? Besides the convenient glue you can easily find at your local art material shop, there are 2 special materials we recommend you to try. These 2 materials are natural and easy to find in your home kitchen. 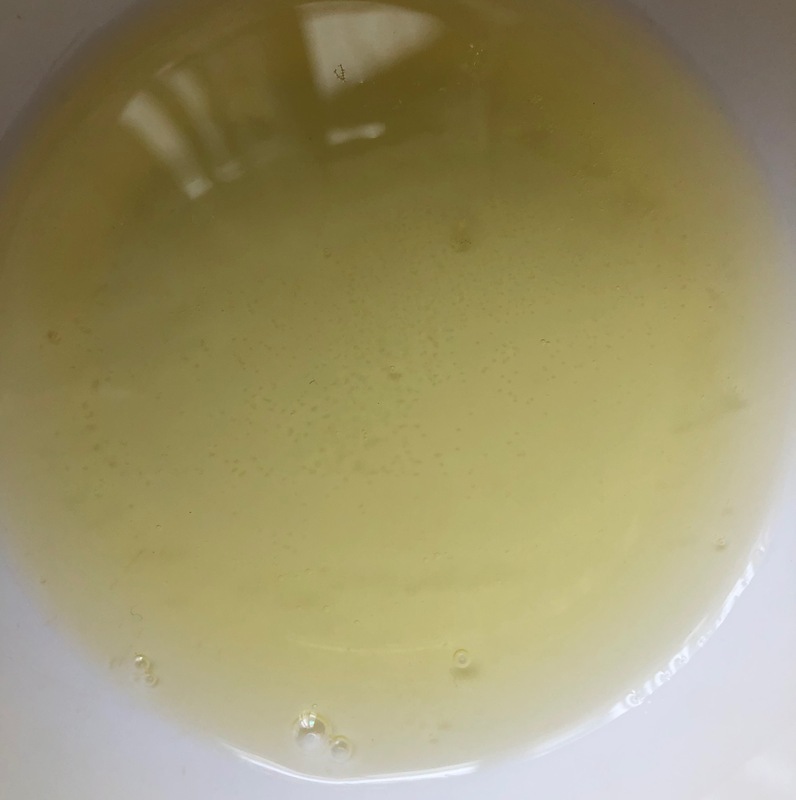 Add a small amount of clean water into the egg white and mix it. Then leave the mixture for one night. The next day morning, you will get very fine natural glue to attach gold foil. The longer you leave the egg white glue, the more sticky it can become and then it is easier to apply. Please also remember to add several drops of white vinegar. The function of white vinegar is help preserve the gold foil from irritants such as moulds, moths, etc. White vinegar has long been used as natural additive to help preserve food/ clothes/ books/ etc. in Chinese history. In China, when we talk about white vinegar, we refer to the vinegar made of rice. You can find such vinegar easily at your local Chinese shop and it is around 1 to 2 EUR for a bottle of 500ml in China. We are not sure if apple cider vinegar can work, but it would be interesting to give it a try. The advantage of this glue is that it is very easy to find raw materials and that it is very easy to make at home. However, the disadvantage is that this glue has a smell and the longer you leave it, the stronger it becomes. 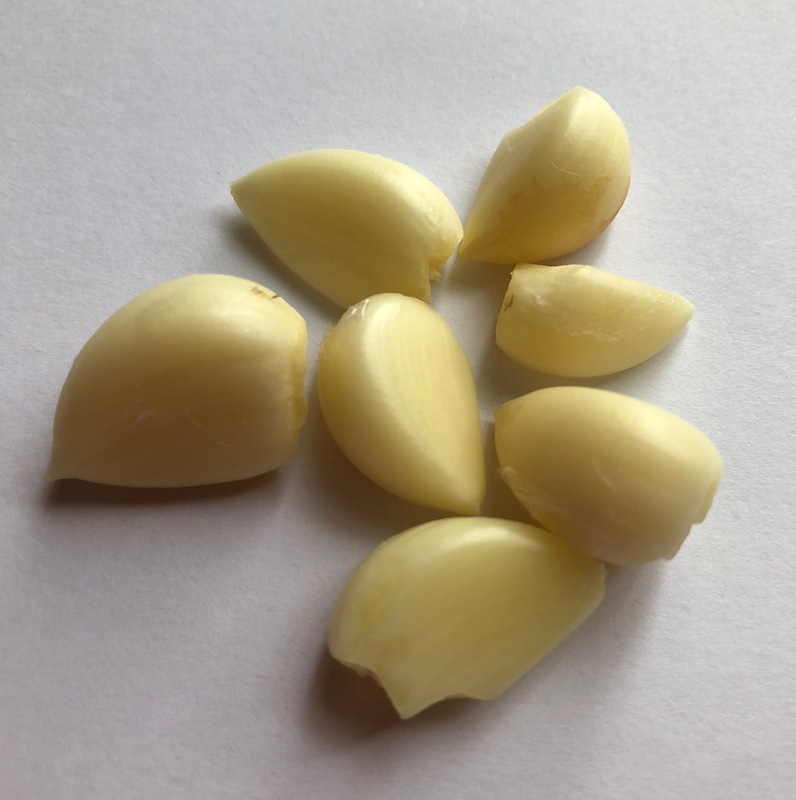 Like egg, garlic is also very easy to get in most areas of the world. Use tool to squeeze out the garlic juice. This sticky juice is transparent and it gets dry very slowly. This is a perfect natural glue and has been used for centuries as glue for gold foil. A tip here we can share with you is that you can add a little bit honey or sugar in the garlic juice. Extra honey or sugar can help make the garlic glue even more sticky. Cinnabar is a magic pigment for gold foil because it helps emphasise the lux of the gold. So far, cinnabar has been proved to the best ‘foundation’ for gold foil. How to apply this technique? apply cinnabar ink evenly on paper/ board with fine wool brush. when the cinnabar layer is dry, use small size wool brush to apply a layer of light glue on the areas where you plan to attach gold foil. use a small wool brush (a normal painting wool brush would be suitable) to attach a drop of clean water on the four corners of the gold foil protection paper. This can help lift the gold foil securely from the protection papers. then you can apply the gold foil on the areas you need. after the gold foil is positioned well, leave one layer of gold foil protection paper on top of the gold foil and use a soft pad to tap the protection paper. This helps to finally fix and attach the gold foil. Different colour of background where the gold foil will be attached on will make the gold show different colour effects. There are some typical examples which are worthwhile to bear in mind. We recommend to use natural colours to go with fine gold foil. * If it is difficult for you to get soft cloth pad in your local shop, you can make one easily at home. Fine out some fine clean cotton and a piece of cotton cloth. Use the cotton cloth to wrap the cotton and then fix it with strings. Now, you get your own cloth pad. This pad is very useful for different painting purposes. We would highly recommend you to make one at home.